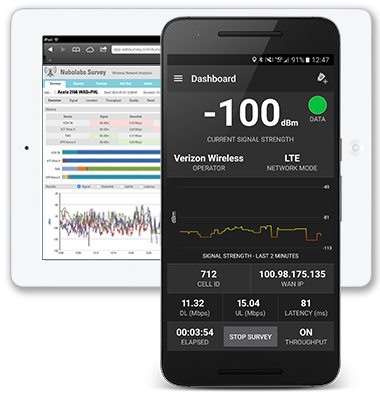 The Best Way to Measure, Analyze and Compare Cellular & Wi-Fi Networks. The Io Analytics platform from Nubolabs helps our customers explore and understand the coverage, performance and quality of wireless networks; monitor the end-user experience; and make informed business decisions based on validated insights. We specialize in tools for wireless network measurement & analysis. 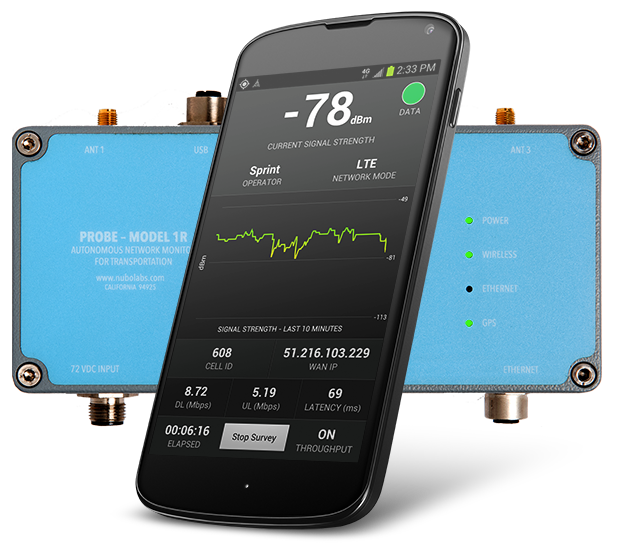 Measure cellular & Wi-Fi networks manually or remotely. Send results to the cloud for analysis, sharing & export. Use results to audit & optimize your network operations. Io Analytics is our next-generation analytics platform that provides maximum flexibility for collecting and assessing network performance and quality metrics both manually and autonomously. Survey runs as an ‘agent’ on consumer Android smartphones to provide a cost-effective method for manually gathering cellular and Wi-Fi network measurements in the field – both indoor and outdoor – and sending metrics back to the cloud-based Io platform for analysis and reporting. For unattended network monitoring in a mobile or static environment, the Probe 1RW is rugged, stand-alone device that automatically performs a suite of tests, gathering wireless network data to the Io platform on a predefined schedule. Io is a robust, highly-scalable platform capable of supporting an unlimited number of Android or Probe agents, and producing near real-time insight of cellular and Wi-Fi wireless network performance, with KPI-based alerts based on pre-defined rules. Io Analytics give you complete network visibility and the power to assess network health and identify issues before your customers do. Sign up for Nubolabs Survey today! © 2018 Nubolabs, Inc. All Rights Reserved. Nubolabs, Io Survey, Io Probe and Io Analytics are trademarks of Nubolabs, Inc.